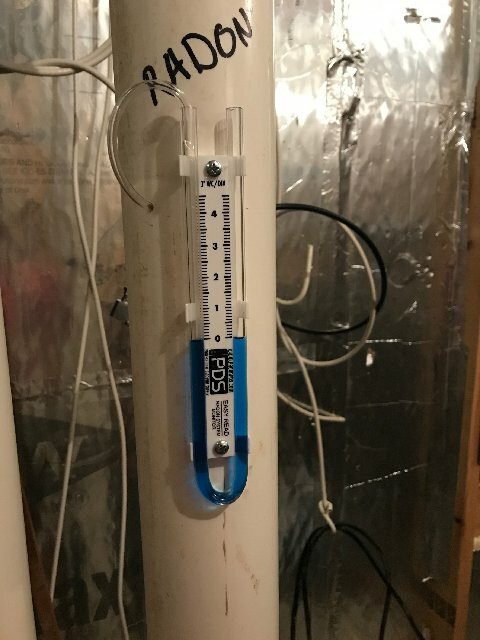 Passive Radon Mitigation System Not Working? We recently had two calls from people that had activated their passive radon mitigation systems by having a contractor add a radon fan in their attic. The radon levels did not go down after the fans were added, and in one case, the levels went up. We were hired to troubleshoot and fix the problems. Here’s what we found. The first is a Minneapolis, MN home built in 2013. The manometer was reading 2.5 inches of static pressure and had a RP265 radon fan that was installed by an HVAC company a few years ago. The vent pipe was routed from the sump basket. The homeowner had done multiple radon tests, but her radon levels remained around 4.6 pCi/L. We started by taking a look inside the sump basket. 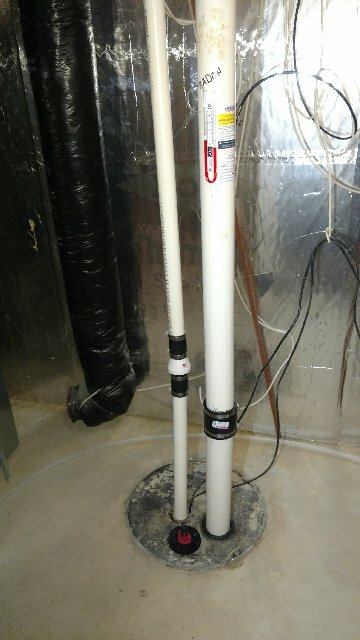 We found that whoever had installed the drain tile had never connected it to the sump basket. The radon fan was not drawing any radon from below the home because the sump basket was completely sealed. This explained why the radon fan was operating at its maximum static pressure and why the radon levels had not gone down. We corrected the situation, ensured that we had vacuum under the entire home by taking pressure field extension measurements, sealed up openings in the floor that should have been sealed by the builder, and provided her with a short-term and long-term radon test kit. The short-term test results came back at 0.3 pCi/L. The second home in Lakeville, MN was constructed in 2014. Her Saftey Siren radon detector was reading 2.6 on the main level. She had a radon contractor activate her passive radon system. After the fan was installed, her radon detector was reading 4.5. Yes, her radon levels actually went up! We had her send some photos to try to troubleshoot it for her over the phone. We noticed that the contractor had left the cork in the manometer. Manometer should not have the rubber cork that can be seen on the top right side. We explained that this cork needs to be removed for the manometer to function properly. 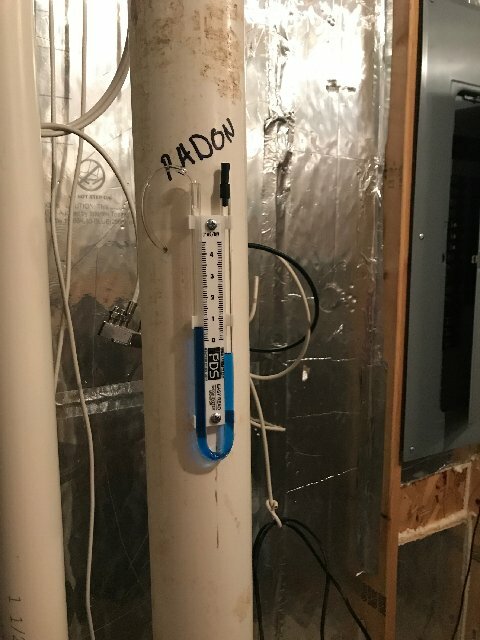 She had called the previous contractor back because the fluid levels in the manometer were equal on both sides, indicating the radon fan was not drawing any radon from below her home. The contractor came back and put a cork in the U-tube gauge to make the levels differ. This gave the false indication that the radon system was working. The fluid levels in the U-tube gauge went to zero when she removed the cork. This indicates that the radon system is not working. We then scheduled a date to see why her radon system was not working to reduce her radon levels. 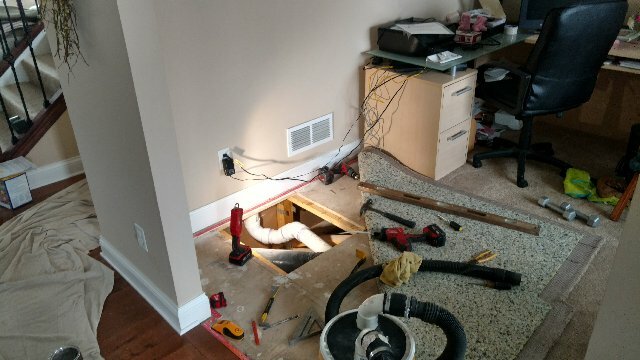 We found that the plumber that installed the vent pipe had created a trap in the pipe. This trap had filled with water and blocked the radon fan from drawing radon from below the home. The problem was that the section of pipe that needed to be replaced was above the HVAC supply ducts and was inaccessible from below. The section of pipe that needed to be replaced was above these HVAC supply ducts. We decided that the best approach was to get access from the office above the bad section of pipe. We pulled back a corner of the carpet, and removed a section of the subfloor to gain access. Gaining access through the office. The U-shaped section of pipe that created the water trap can be seen. We cut out the trap, and replaced it so that it would allow condensation inside the pipe to drain back to the sump basket. The trap was replaced, allowing for proper drainage. We then replaced the section of plywood, and put the carpet back down. 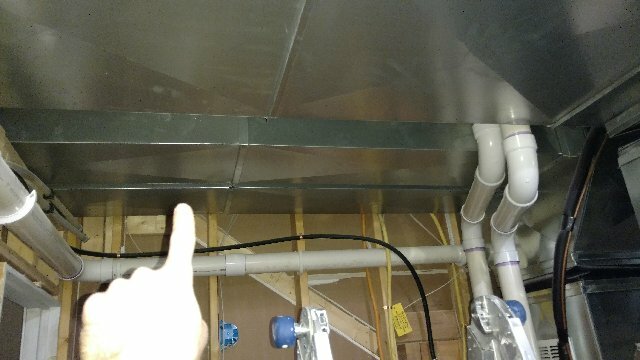 Pitching the pipe in the attic to allow condensation to drain. Securing the vertical pipe every 8 feet, and the horizontal pipe every 6 feet to meet code requirements. Insulating the vent pipe in the attic. 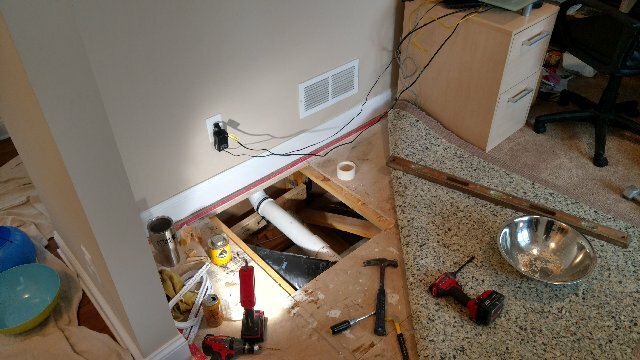 Installing a disconnect that allows for the removal of the sump basket cover. Adding an access port on the sump cover. Affixing a label next to the manometer. Labeling the pipe, circuit breaker, and sump cover to meet code requirements. The disconnect, labels, and access port can be seen. Her Saftey Siren radon monitor is now reading between 0.3 and 0.5 pCi/L in the basement. Her Airchek radon test kit came back at less than 0.3 which is the lowest that the kits can detect. Unfortunately, passive radon mitigation systems are typically installed by a plumber and other contractors as the home is being built. These contractors do not always understand how radon mitigation works. Often they are not installed correctly and don’t work. Sometimes they can be fixed, but sometimes they are so bad that they have to be abandoned. Be sure to test your radon levels even if your home already has a passive radon system installed. Studies have shown that they reduce your radon levels by about 50 percent. If you are having troubles with your radon mitigation system or are building a new house we would love to help. Feel free to reach out to us anytime. Previous Post: What is Radon Mitigation?Next Post: How Much Does Radon Mitigation Cost? What Radon Test Kit to Use?